I don’t know if the weather is different this year or it’s my pregnancy, but my hands have been DRY. My hands have always dried out a little in the winter but this year they are so red and dry they actually burn when I wash them. I’ve tried every lotion I own but nothing has worked. I then did some research and read that the trick is to exfoliate, moisturize and heal your dry skin. That’s when I knew it was time for a Simple DIY Hand Scrub for Dry Hands. *This post is in sponsorship with Jord Watches. I’ve also finally stopped biting my nails so can show them off in photos. That’s neither here nor there but I like to celebrate life’s accomplishments when I can, ya know? If you also have dry hands I wanted to offer a few extra tips before we get to the scrub itself. DO NOT try the hand scrub if your hands are still cracked. Not only will it burn, but the cracks could potentially allow bacteria and other bad stuff to get into your skin. So what’s a girl to do? Get a very thick perfume free hand cream or natural oil, rub on your skin before bed, cover with gloves and head to bed! Yes, it is weird to sleep with gloves on. But if you need some serious relief you won’t mind as much. I love grape seed oil because it is light and full of nutrients. If you want more information, here is a post I wrote on why grape seed oil can do wonders for your skin. It’s also easy to find online or at health food stores and inexpensive. However, my skin was SO dry that I needed something stronger. I picked up a tube of Aquaphor ointment (actually, I bought the CVS knock-off brand), and followed the instructions above. HOLY COW. This is the first time my hands have not felt like a dry dessert in weeks. If you too are suffering from severe dryness and cracks – try this out. Repeat this step as many times as you need to until the cracks are gone. Gone? All right. Let’s get to that scrub. Remember when I said the three key tips to heal dry cracked skin were Exfoliate, Moisturize and Heal? Well, those steps also make up the three ingredients in this scrub! a.). You will want to start by melting the coconut oil. I use the microwave and just go 10 seconds at a time until it is completely melted. b.) Pour sugar into melted coconut mixture. c.) Add lemon essential oil or juice. d.) Add in more oil as needed until it reaches a consistency you like. I’d recommend it should be like wet, but not soaking wet, sand. You may like it more or less dry, though. If you want it colored add ONE drop of food coloring. I used pink so I basically made a pink lemonade scrub. Sweet. 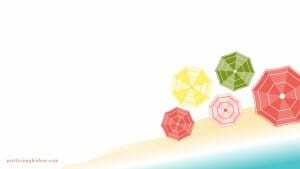 Avoid any artificially fragranced lotion (I’m looking at you Bath & Body Work) which will only irritate your skin further. Try a natural simple one like one from Burt’s Bees, Kiss My Face, or experiement with clean organic brands from Amazon. I also heard Spectro Kids Face and Body Intense Rehydration Moisturizer are good ones to try. 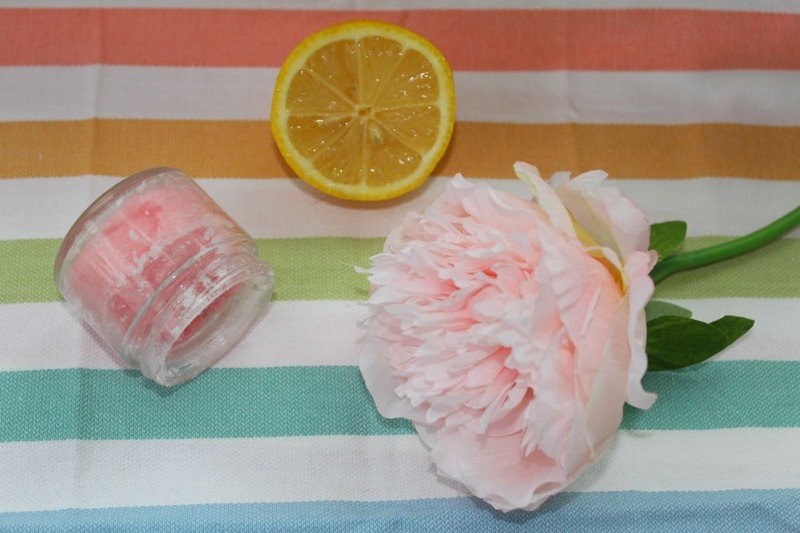 If you’d rather make your own then you will love this washed ghee moisturizer. It takes a while to make but is WELL worth the effort. 4.) Show Off Those Pretty Hands! 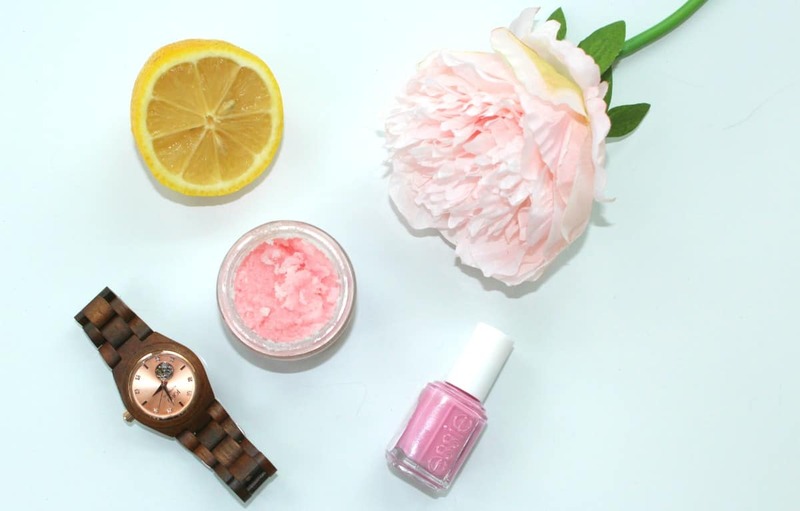 Now that our hands are polished, soft and moisturized, what better way to show them off than with a beautiful new watch? I’m very into natural pretty elements which is why I LOVE the unique watches from Jord. If you haven’t seen then yet check them out. They are the kind of watches people notice instantly and I’ve been getting so many compliments since receiving mine. I’m not a big jewelry person, but I’ve always loved watches because they are both an accessory but also very practical. 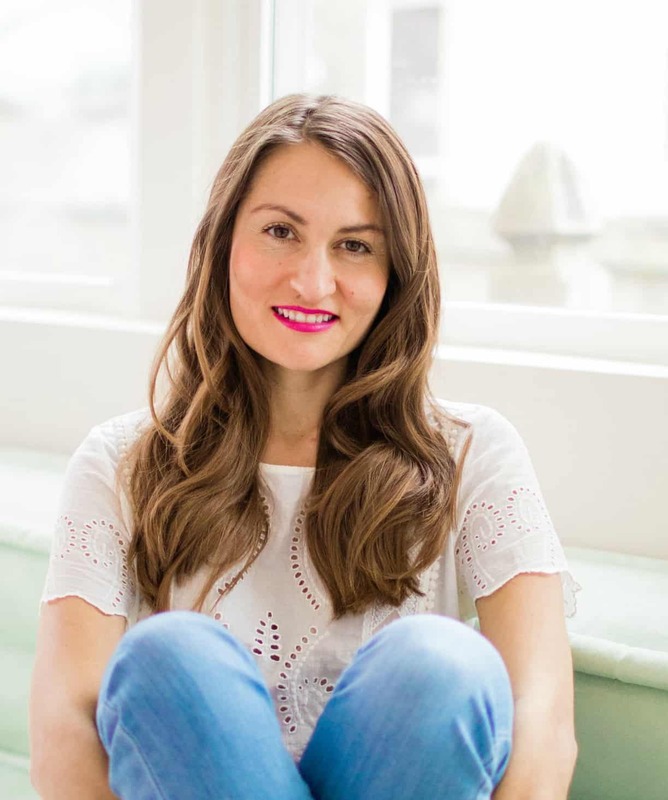 I have a pretty busy schedule these days with my full-time job, blogging, renovating our 1940s house, and preparing for a baby. Needless to say, I need to know what time it is constantly, but I like it to be something pretty I can wear as well. Here I’m wearing Jord’s Koa & Rose Gold that matches everything. Not only do they have women’s watches, but friends, you can get your guy a Men’s Wood watch that is not only masculine, but unique as well. Oh, and when you are that special someone receive the watch you will feel SPECIAL. It comes in a beautiful box with a cleaning cloth and mini cleaning stick so you can continue to care for the beautiful wood. And I wouldn’t just tell you about a watch I love without giving one of you a chance to win one, would I? Nope. Yes, one lucky person can win a $180 towards a watch of their choice – either for yourself or a special guy in your life. Just head over to this link to enter the Jord Watch giveaway! This way, if your significant other got you a vacuum for Valentine’s Day you can still get something nice. Or, you could be extra nice and get him one of his very own engraved watches. Head to the Jord Site to enter. Contest Ends March 11. Good luck! Oh wow I did not know that it can be so easy to make a hand scrub. I will definitely try it out this spring! This one smells awesome, too. My hands are sooooo dry this winter! Between washing them constantly and the weather, mine look and feel terrible. I do the glove trick pretty frequently, and now I need to make your scrub. It’s be a super cute Valentine’s present too. The glove trick was a game-changer. My friend is a nurse and is having a horrible time with her hands from washing them so much. I’ll have to share this with her! Such an easy to make scrub! I have all of the ingrediants at home too. My hands are so dry this winter, I will have to try it out! Yay! It’s even better when you already have everything on hand. I always have dry hands in winter. Thank you for this and for the tip about sleeping with gloves on. I may have to try it! Yes – it’s amazing! You must try the gloves. Haha I know you are Candy. You hand make everything! 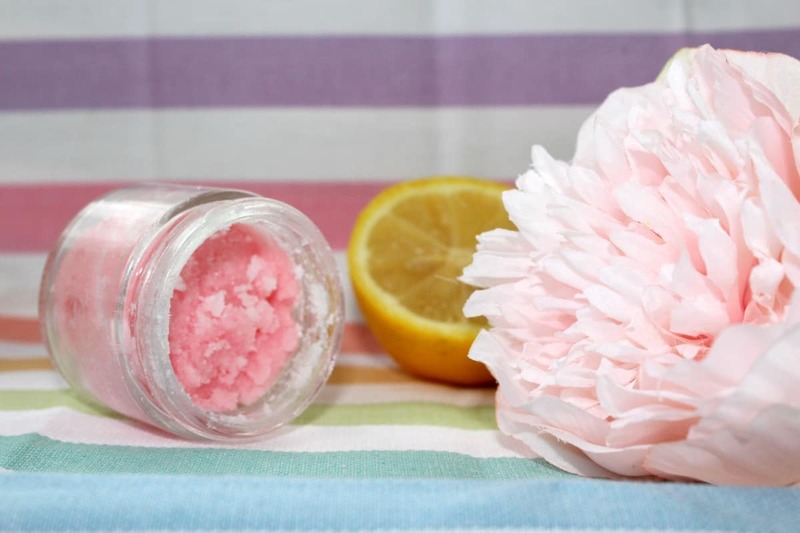 I love homemade beauty products like this, thanks for sharing! I struggle with dry cracked hands all the time. Love that you gave instructions on how to make it at home. I will have to try this soon. I have never made a body scrub before, but this is something I can definitely do. And coupled with Aquaphor, my skin will be baby soft. I use Aquaphor on my daughters’ faces every day to fight the harsh cold and dryness here in New England. Oooh cool to hear you like Aquaphor too! It’s definitely helped. Oooo! Good idea with the Aquafore! I need to do that tonight! And the sugar scrub sounds awesome too! I don’t have any lemon EO, but I have lime. I’m assuming I could use that instead. Just use a real lemon! Love this, I am definitely feeling the dry skin with all this cold weather. Come on Spring! haha and the vitamin D!! My hands are very dry and sensitive, especially during the winter. I will definitely do the trick using gloves and the hand scrub! Woohoo – let me know how it goes! Yes, please! I hope it works! Oh this looks great. First of all, I love DIYs. Secondly, I battle dry skin, so I am looking forward to trying this. Nita – I hope it works! And don’t worry, dudes, JORD makes watches for men too. 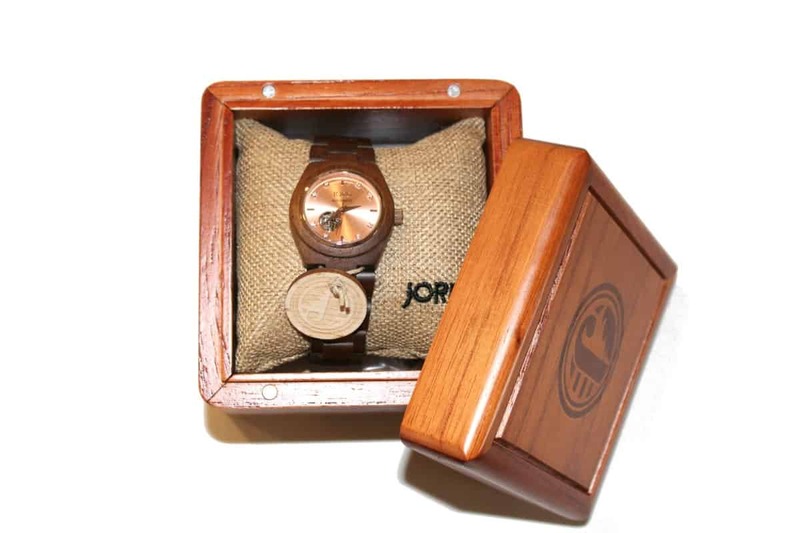 Since I’ve talked up this women’s wood watch from JORD so much, it’s only fair that I help you get one too. I love the pink! Those nails match that watch perfectly. Oh I need this scrub! My hands are cracked and dry. They even hurt! 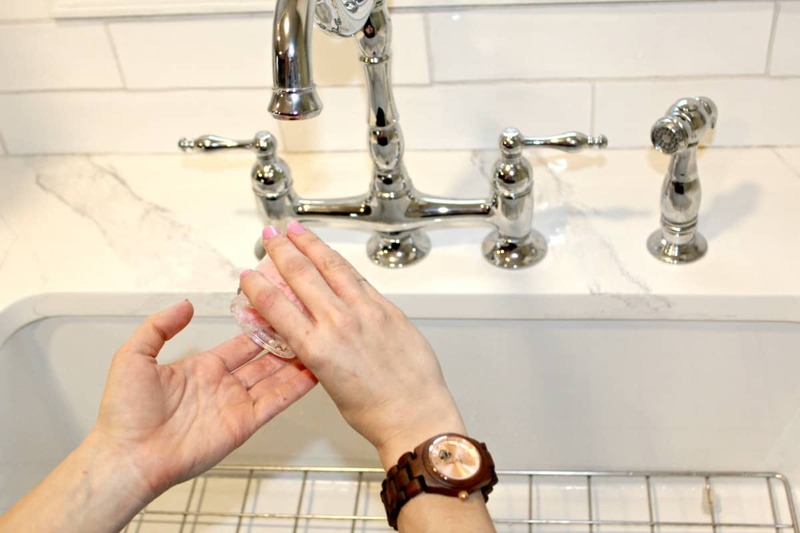 So often we forget to take care of our delicate skin on our hands with all the hand washing and sanitizer we are using to get thru the germy winter season. I was just looking at my hands today thinking I need a hand makeover. I may polish my nails today. Then I’ll put on some blingy rings and a nice watch! 🙂 Thank you! So painful, right? Yes, give them some TLC! This is exactly what I need! I suffer from Eczema and my skin is constantly dry, itchy, and peeling. I need something just like to to help alleviate some of the pain that comes along with this super dry time of year. 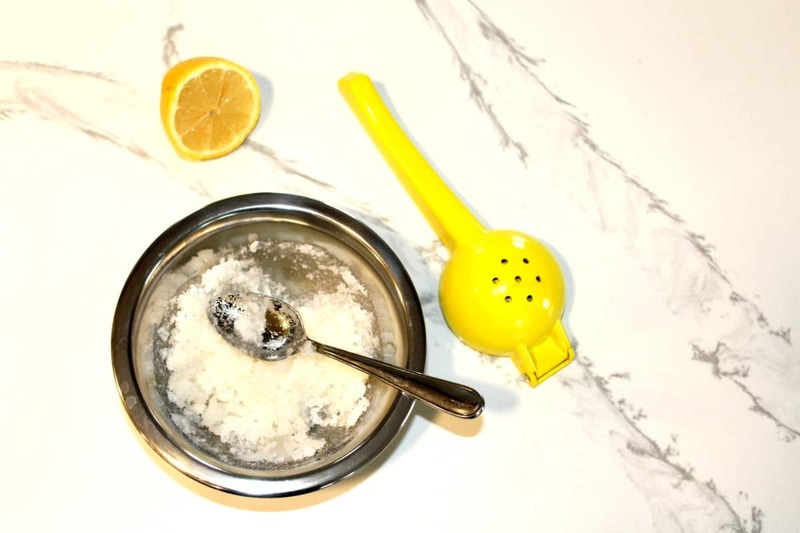 Love this scrub, I have been making a similar recipe for a few years now but I place some lavender essential oil in mine and use it at night to help me unwind!!! Great Post!! Love lavender for that reason! I will have to try that next. I love sugar scrubs but have only every purchased them pre-made. I’ll have to try your tutorial. Thanks for sharing! This post is so timely! My hands always get super dry during the winter season. They get cracked and red. Thank you for sharing your tips which I will be trying tonight! Good luck, Jessica. I hope it works for you! Yes! It is great for both. Usea gentle exfoliating scrub during the winter months to remove dull skin cells. I make my own sugar scrub using 1/2 cup of brown sugar and 1/4 cup of olive oil. I mix the brown sugar and olive oil together until it’s blended well and then use it in the bath or shower to exfoliate the natural way.